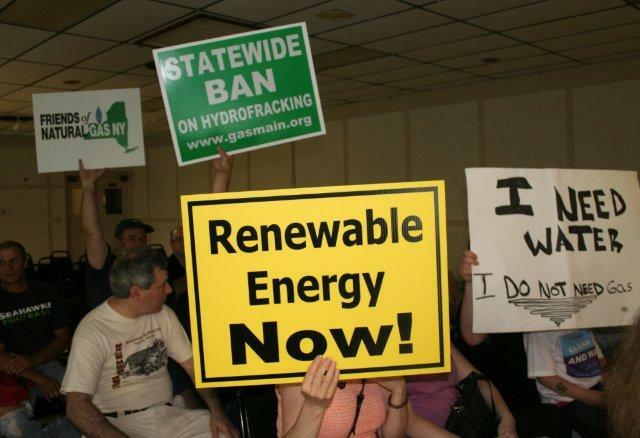 According to Casey Seiler, who collects breaking news for the Times Union's "Capitol Confidential", the much anticipated SGEIS (Supplemental Generic Environmental Impact Statement) on high-volume hydro-fracking should be out this Friday. Here's a short video of DEC Commissioner Joe Martens saying the agency is scurrying to finish it up and hopes to meet Cuomo's July 1 deadline - or at least shortly thereafter. And, yes, there will definitely be an opportunity for public comment. But will it be 30 days or longer? Some legislators and town boards have already sent resolutions to the State asking for 90 days. The draft SGEIS ran close to 800 pages. If the completed document is anywhere near that long - that means reading 25 -30 pages every day for the month of July, leaving little time to grill burgers and ooh and aah over the fireworks. On Saturday a couple thousand people headed to Ithaca College for the EPIC No Frack Event - a day-long "teach in" that featured 45 speakers, ten musical groups and six movies. Scientists, activists, lawyers, farmers, economists and frack-activists shared their news and views about everything from community organizing to how the EPA models risk management. 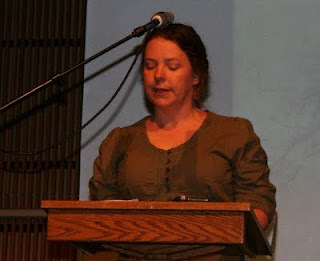 Simona Perry, who studies community sociology, talked about how shale gas drilling is fracturing communities along the Susquehanna River in PA. The first people who suffer the impacts of drilling are those who live in rural communities, she said. That’s because they live right where the gas is being extracted. In Bradford County, a 45-minute drive from Ithaca, the increasing number of well pads has removed 16,000 acres of land that used to grow crops and timber or provide habitat for wildlife. Another 7500 acres has been cleared for pipelines, access roads and pipe yards, with close to 200 acres converted to gravel quarries. 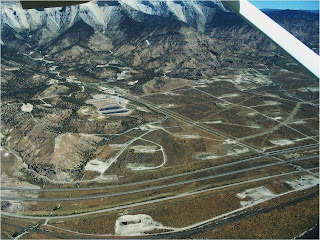 “By the end of 2011 some 37,000 acres will have been converted to gas use from other land use,” Perry said. Gas developments have brought many changes to the rural towns in Bradford County, forcing long-time residents to reevaluate what they knew about their local government and their neighbors. “When you can’t drink water from your faucet, it affects your sense of security and trust,” Perry said. Over the past two years Perry asked dairy and small farmers to document how their lives are changing, through photography and writing. Many people wrote about the quality of life that brought them there: clean water, fresh air, fertile soil and the desire to pass their farms and land on to their children. Dr. Stephen Penningroth explained that EPA measures risk in terms of both exposure and toxicity. For even the most toxic chemical, if it doesn’t get into the environment there is no exposure; there is no risk, he said. The problem with risk assessment related to fracking is that many of the chemicals don’t show up on the toxicological screening list – the “priority pollutant list.” Add to that the lack of completed “exposure assessments”, and you end up with a high level of uncertainty. And that means that politics, not science, dictates how environmental risks are managed. The most obvious solution, Penningroth said, is to require that drilling companies inject tracer chemicals into their fracking mixes. 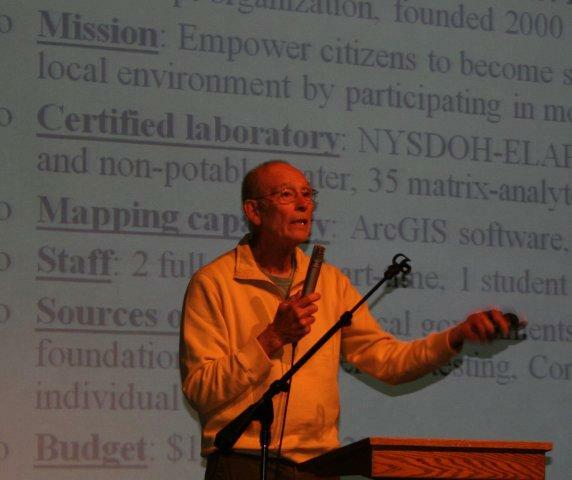 He also suggested that communities develop stream monitoring programs. Shale isn’t the only thing that’s getting fractured in this region. 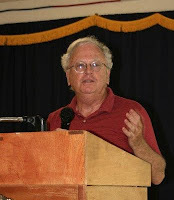 Communities are too, as last night’s talk at the Vestal American Legion illustrated. 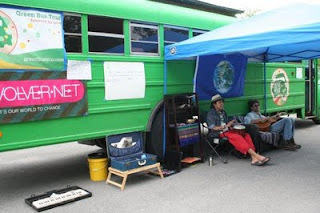 Pulteney (NY) farmers-turned-filmmakers Jeff and Jodi Andrysick have been presenting a traveling roadshow in the Marcellus region - a program of stories from those living in the Colorado drill zone. 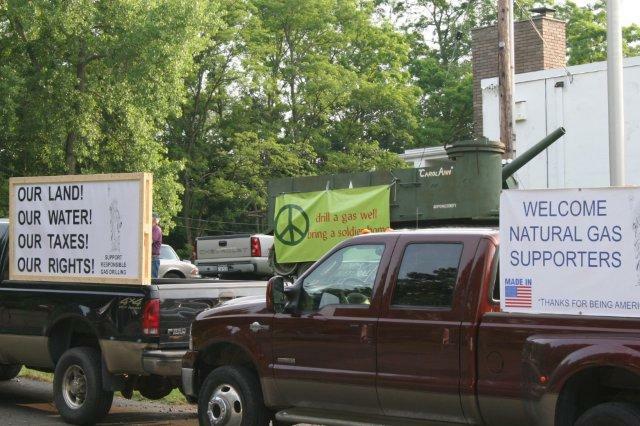 Huge pickups plastered with banners thanking drilling supporters for “being American” lined the driveway, and members of the Joint Landowners Coalition stood about holding “Friends of Natural Gas” signs. The stories of contamination are just lies and belong in tabloids alongside tales of alien encounters, they insist. Inside the Legion Hall they settled onto folding chairs behind equally passionate residents holding “no frack” signs and hand-lettered posters declaring their need for water, not gas. Weston Wilson spoke first. 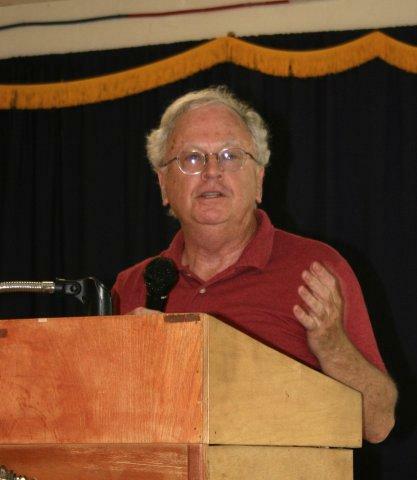 He's the environmental engineer who blew the whistle on the EPA for whitewashing the 2004 hydraulic fracturing study. The problem, he says, is that the oil and gas industry enjoys a great many exemptions from regulations. Take the Safe Drinking Water Act – Congress specifically exempted the practice of injecting fracturing fluids during drilling from the SDWA. It’s telling that the exemption doesn’t extend to cases in which they inject those same fluids into disposal wells. Wilson listed some of the problems with wells: faulty cement casing, spills, and mismanagement of returned fluids. The National Transportation Safety Board investigates plane accidents, he said. We need something similar for the oil and gas industry. 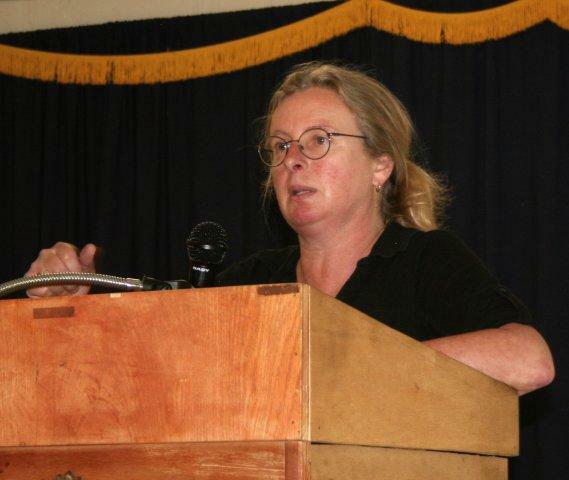 Tara Meixsell, author of Collateral Damage said the gas boom changed her life. Colorado law allows drilling as close as 150 feet to homes, a distance that exposes families to dust and chemicals. Some of those chemicals, such as 2-Butoxyethanol (2-BE), are carcinogenic. 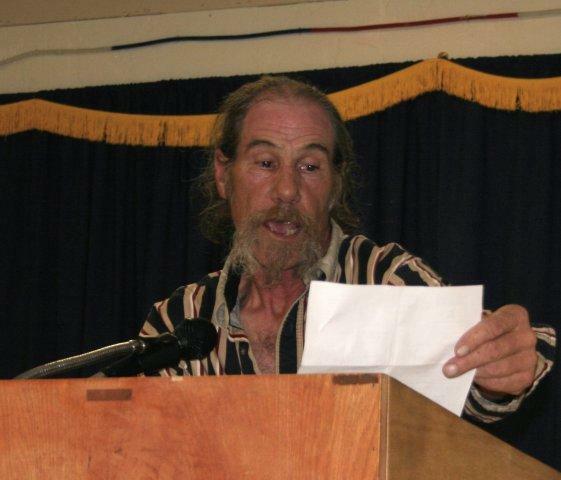 Meixsell shared stories about friends and neighbors who suffered ill health from exposure. Colorado rancher Rick Roles told how drilling affected his horses and goats. He leased his land because he thought it would bring the ranch much-needed income. Now he’s got 19 "holes" on his land and another 100 wells within a mile of his home – plus three compressor stations and a water treatment plant within a mile and a half. He listed numerous problems: mares aborting foals, studs becoming sterile, goats having stillbirths, and his own health problems. He also spoke of how spills were covered up with dirt instead of reported, and a persistently leaking condensate tank. When Roles finally got a toxicology screen he discovered high levels of benzene, toluene, xylene and a long list of related chemicals in his blood. 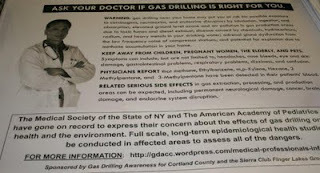 The goal of last evening’s program was to allow those suffering negative impacts of gas to share their stories. But it was clear that some people, a minority to be sure, came with no intention of listening to what the speakers had to say. When the question-and-answer session grew contentious [“frack-tious” one person called it] moderator Don Glauber reminded people to be civil. When you kick a hornet’s nest, you rile up the hornets. That’s what Town of Caroline councilman Peter Hoyt told listeners of WCHU during a Wednesday morning radio interview. The night before he and the other four members of the Town Board listened to residents express concern over a proposed resolution for two hours. Tuesday night, June 14 close to 250 residents from Caroline and neighboring communities squeezed into the Brooktondale Community Center. What brought them there, on an evening when they could have been weeding the tomatoes? A proposed town resolution stating that the town would “not attempt to either encourage or limit gas drilling in the Town of Caroline”. Before the meeting a small crowd gathered, carrying signs reading “No ban on bans!” and “Don’t Frack with Democracy”. “I’m here to support democracy,” said Laurie Roe. She holds a sign that says “Democracy means listening to your neighbors”. Roe fears that the council’s resolution has the potential to silence citizens and quash local democracy. Sara Hess says, “I’m here to protect my water.” An Ithaca resident, she lives downstream from Caroline and gets her drinking water from Six Mile Creek – which is where runoff and streams in Caroline eventually end up. Meanwhile, on the other side of the circular drive the Tompkins County Landowners coalition set up an information table stacked with handouts on what to look for in a lease. The town council set aside a couple hours to listen to constituent concerns, but with 46 names on the speaking list and people standing three deep at the back, it was clear that the meeting would go longer than originally scheduled. Indeed, the council allowed everyone to speak, ending the meeting at 10:30. Despite many requests to withdraw the proposed resolution, the council tabled it until the July meeting. Bill Podulka, chairman of ROUSE (Residents Opposing Unsafe Shale-Gas Extraction) called for the council to withdraw the resolution because it is premature and stifles democracy. “We ask that our town board listen to the people with open ears,” he said, referring to a petition that his group plans to present in a couple weeks. During the evening a number of speakers expressed concern about ethics violations and conflict of interest. In light of the Supreme Court’s decision Monday, they suggested that town councilors with oil and gas leases recuse themselves from voting on the resolution. “I’m concerned that some people could take away the rights of landowners,” said councilman Peter Hoyt who co-authored the questionable resolution. He admitted that he leased his land – “it’s only 15 acres, and it wasn’t much money,” he said in a phone interview the night before. “Just $3,000 – and they can’t even drill on my land.” Hoyt’s lease prohibits surface activities. It’s not the amount that has folks all a-twitter. It’s the principle of the thing. People want assurance that their elected representatives are not financially beholden to corporate interests. Monday, June 13 will be a busy day in Washington – Pennsylvania, that is; not DC. That evening the Secretary of Energy Advisory Board (SEAB) Natural Gas Subcommittee will hold a public meeting to “allow subcommittee members to hear directly from community members interested in the safety and environmental performance of hydraulic fracturing”. President Obama directed US Secretary of Energy Steven Chu to form the Natural Gas Subcommittee as part of the President’s “Blueprint for a Secure Energy Future” - a “comprehensive plan to reduce America's oil dependence, save consumers money, and make our country the leader in clean energy industries”. So back in May, Sec. Chu announced the establishment of the Energy Advisory Board Natural Gas Subcommittee on Fracking Issues. Their job is, he said, is to make recommendations on improving the “safety and environmental performance” of hydraulic fracturing in shale formations. The meetings were only being held in Washington, DC, far from the areas already damaged by drilling. Besides the SEAB Natural Gas Subcommittee, lots of other people plan to head for Washington Jefferson on Monday. And some of them will have a sweet ride. On Thursday, June 9 Thomas Shepstone, from Energy in Depth, offered free bus rides for those wishing to attend the DOE meeting. Airfare (for older folks, especially..and for heads of landowner groups. I am bummed that I haven’t made it onto his invitation list…. IF you go to the meeting intending to give comments, arrive early to register. The DOE is allowing 105 minutes for public comment and limiting each person to 2 minutes of oral testimony. They will also accept written testimony (see below). And, for those who cannot make it to the little town 40 minutes south-west of Pittsburgh, the DOE will broadcast the meeting live via webcast. The link to the webcast will be made available on this site on the day of the event. Go to www.shalegas.energy.gov for more information. Drive south of Ithaca just a few miles and you come to the Town of Caroline. 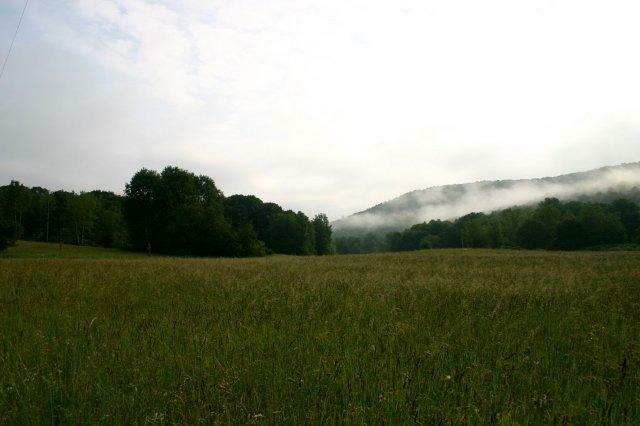 It’s a lovely mix of rolling hills, farms and several small communities. People move here to raise their vegetables and children in a quiet rural environment. They stay because of the community. But that sense of community may be fracturing. About 55% of the land in the Town of Caroline is leased to gas companies and some residents worry that a minority will rake in economic benefits at the expense of the majority. They are concerned that industrialized drilling could contaminate their water, pollute their air, affect soil and food production, drastically change land use and damage publicly-funded infrastructure. So over the past few weeks a few of these folks have been walking through their neighborhoods carrying a petition. It’s a simple petition, only 55 words long: We, the undersigned residents of the Town of Caroline, urge the Town Board to ban gas extraction using high-volume, slickwater, hydraulic fracturing in the Town of Caroline. The methods used and the intensity of industrial development threaten our clean air, clean water, soil, rural landscapes, and health, as well as our social and economic well-being. More than 900 Caroline residents have already signed the petition - more than three times as many signatures as any other petition drive in the Town has ever gathered, says Bill Podulka. He coordinates the local activist group ROUSE (Residents Opposing Unsafe Shale-Gas Extraction) which is spearheading the petition. 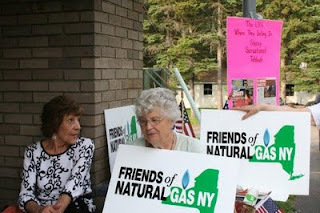 “Momentum to ban gas drilling by local rule has been building across Tompkins County,” says Podulka. 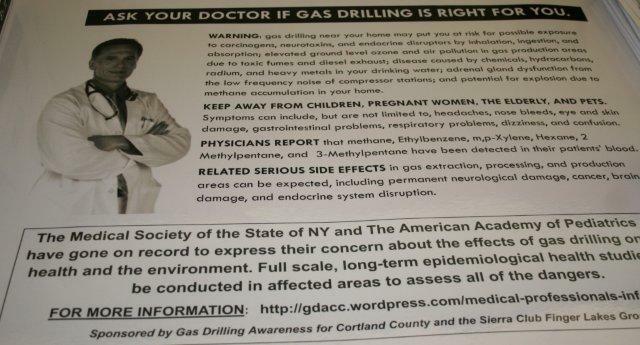 “This week the city of Oneonta voted to ban all forms of gas drilling within city limits, and Buffalo has already enacted a similar ban.” Even closer to home both Dryden and Ulysses boards are exploring legal options to draft a fracking ban. And that has some Caroline town officials running scared. Two town council members have decided to take preemptive action – they’ve submitted a resolution that would preclude the board from taking any action to consider drafting a local ban. “Before the petition is presented and before necessary legal research is done,” says Podulka. Council members Linda Adams and Peter Hoyt co-authored the legislation, and Toby McDonald supports it. Should gas wells be drilled in town, all stand to benefit: Hoyt and McDonald have leased their property to gas companies, and Adams directs the Tompkins Landowner’s Coalition, a group whose sole purpose is to help landowners obtain the best lease possible. Adams and Hoyt don’t see a problem with their proposed law. 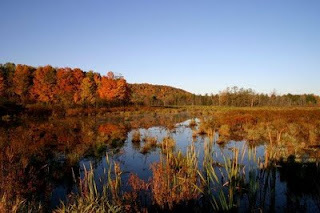 They contend that local drilling bans are not permitted because New York State statute preempts local regulation of natural resource mining activities. But many legal experts dispute this interpretation of the statute. They say that although local regulation of the day-to-day operations of resource extraction is indeed prohibited, there is ample case law to show that outright banning, which falls under local land use determination, is permissible. Residents are outraged. 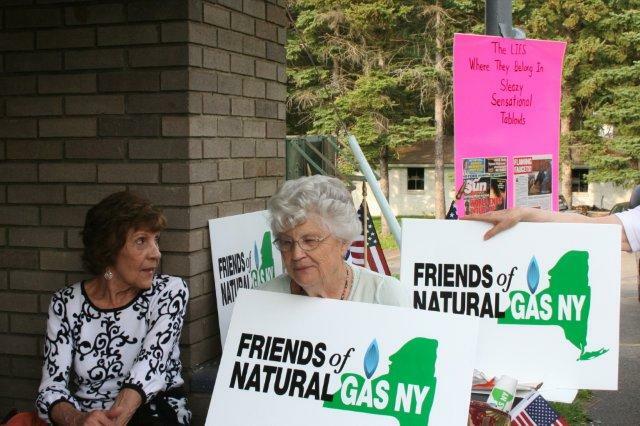 “Given that these elected officials all have ties to gas leasing, their action strikes me as a brazen abuse of power to benefit their own self-interests,” says Irene Weiser. The Caroline Town Board will hold its public business meeting on Tuesday, June 14, at 7 pm. Public comments regarding the proposed resolution will begin at 8:15 pm, after the Board considers other matters. Resolved that the Town through its authority under the Stormwater Law will protect local water supplies from any damaging effects of surface runoff due to gas drilling or any other large scale industrial activity. Chesapeake is still trying to extend leases in NY by any means possible, and that means invoking “force majeure”. Force Majeure was originally intended to protect contractors from being held responsible when they couldn’t complete work due to events beyond their control – things like floods, hurricanes, tornadoes. Now they are using the force majeure clause in leases to shift their economic risk onto the landowner, says attorney Chris Denton. 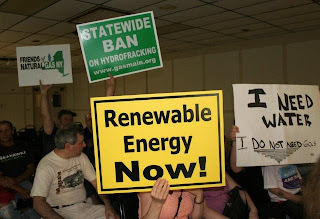 Companies claim that they cannot drill because NY does not allow hydro-fracking. If they can successfully extend the leases, that transfers economic risk to the landowner by trapping him in a lease at a market price that made sense five years ago. The truth is that there is nothing preventing companies from drilling. But that isn’t stopping Chesapeake from filing lease extensions. “They bring them in batches of 30 to 40,” says Cortland County clerk Elizabeth Larkin. But she’s not accepting lease extensions because they are not signed by the landowners – and she may be the only county clerk to refuse filing the documents. “They say that they need to extend the leases because of force majeure, or they claim that the original lease gives them an option to renew,” Larkin said in a phone conversation a couple weeks ago. But an option to renew is a lot different than an automatic renewal or extension, she says, and so far Larkin has refused to file the extensions. The county attorney is backing her up. Larkin hopes that other county clerks will take a similar stand, but acknowledges that it’s hard to refuse recording a document when each one brings in much needed cash to the county. 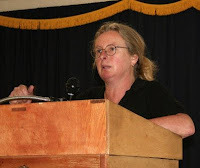 Every lease extension she refuses costs Cortland County $20 – “and I’ve refused hundreds,” Larkin said. Force majeure isn’t the only Ace companies have up their sleeves. According to attorney Joe Heath, energy companies are now crafting leases that contain a non-termination clause. The law, he said, protects gas companies, not landowners.